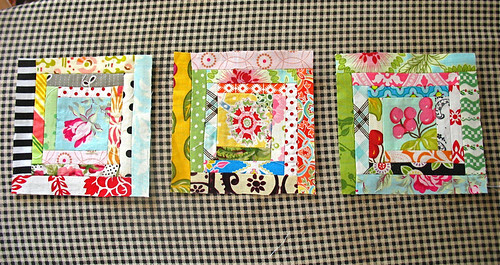 Autumn Schmautumn - Stop staring and start sewing! Well, while everyone else is blogging about the golden leaves in their yard and pumpkin spice muffins in their oven we've still got 100 degrees here. Ughetty ugh ugh. On the bright side it's supposed to drop into the 90s on Saturday. I bought some apple spice Glade Plug-ins to stir up some fall ambiance here but it only works if I keep the doors shut and the A/C turned down low. This last week has been nuts and I'm glad to have some sit-down time with my computer (hopefully I'll get some time with my sewing machine tomorrow). 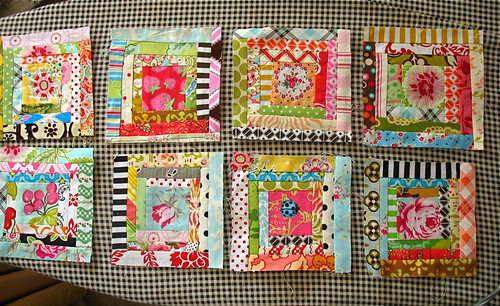 I did do a few more scrappy squares so I have a small sense of accomplishment. I think I'm getting better with experience. Here are my 3 new ones. So I'm up to 8 now and I think they make a happy collection! You really need to try this, it's actually very relaxing. Since I don't have anything else to blog about I figured it was about time I responded to one of those "taggings" and post 6 odd facts about myself. I've lost track of some of the people who have tagged me over the past year but I know Blayne did, and Myrinda, Michelle, and Marie. I hope I remembered everyone so I can tell them to knock it off. 1. I'm the youngest child in my family (which explains the whole "look at me! look at me! over here!! watch me!" thing). 2. I've been in 38 of the states. You can ask my husband and my brothers-in-law about "The Trip" and I'm sure they'd love to share the stories we've told them (my dad bought a motor home and took us all over the country in the summer of 1975 and we talk about it all the time. Drives them nuts, ha!). 3. I can touch my nose with my tongue (I can actually sort of pick my nose with it too but that would be rude to share). 4. I love word puzzles. Not so much crosswords, but the cryptograms and cryptic crosswords (I've heard it keeps dementia at bay too, so check back with me in 30 years). 5. 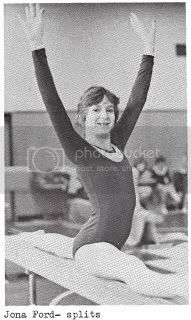 I was in gymnastics in Jr. High and on the dance team in high school (Go Falconettes!) and I can still do the splits. Here I am in all my awkward 8th grade glory. Braces, dorky hair (could never quite get my "feathers" right), the whole package (angst included). Okay, that's it. I can't think of anyone to tag right now and I want to keep all of my friends so I'll have to think on it some more. Okay, fine! Here's the dumb snake! I can NOT believe how many of you actually want to see it! 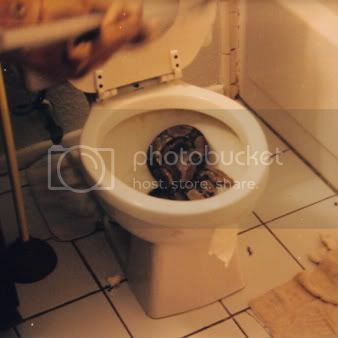 This is just the top part of the snake, the rest of his body is still stuck down the toilet. If you need me I'll be at my therapists.